The 3303 Water Street condominium is Washington, DC represents an elite level of luxury living. Condos for sale at this elite Georgetown address start at a cool million bucks and quickly climb from there. In fact, listings can go as high as $9 million! Quite obviously, this is not a place for bargain hunters. 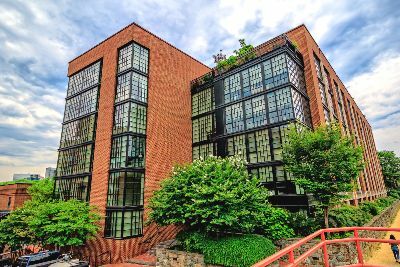 Developed by EastBanc and completed in 2004, this nine-story luxury condominium building stands at the edge of the Potomac River in one of the District’s most exclusive neighborhoods. There are 72 residences here with floor plans ranging in size from around 1,000 to over 6,000 square feet. Imagine having a condo that’s bigger than most mansions? From the highly contemporary exterior with its glass and steel design to eye-popping penthouses, 3303 Water Street truly represents life at the top. Not only is there an elegant main lobby with front doorman and 24-hour concierge service, the building also has additional two-story lobbies at each upper level. Residents also enjoy secure parking, a state of the art gym, a party room, business center, roof deck with incredible views and a heated swimming pool. But all of this is just a prelude to the residences themselves. Huge living spaces are complemented by floor-to-ceiling window walls allowing banks of light to wash over wide-plank hardwood floors. Many of the units also have private outdoor spaces, whether balconies, patios or terraces. The open Euro-style gourmet kitchens feature custom cabinets, granite counters and top-brand stainless steel appliances including Sub-Zero, Miele and Gaggenau. Also notable are the stunning spa baths with their deep soaking tubs, frameless showers and marble and limestone finishes. The breathtaking views at 3303 Water Street are yet another selling point, featuring the Potomac River, the Chesapeake and Ohio Canal, the Friends of the Georgetown Waterfront Park and the DC skyline itself. Residents might also wish to exit their sumptuous digs every now and then, to dine at the waterfront, shop at the many designer boutiques or gather groceries at Whole Foods or Trader Joe’s.